MONROVIA, LIBERIA (AP) — Remembering those who have died in the world's deadliest Ebola outbreak, Liberia's president opened one of the country's largest Ebola treatment centers in Monrovia on Friday amid hopes that the disease is finally on the decline in this West African country. American and U.N. officials as well as Cuban doctors were in the crowd as President Ellen Johnson Sirleaf opened the treatment center, which is set up to hold 200 patients and can eventually treat as many as 300. With the opening of the center, an Ebola treatment unit at JFK Medical Center has been closed. Many people with other diseases had been nervous about going to the nation's largest referral hospital, and officials hope they will now come back. Others believe Sirleaf's order that the bodies of Ebola victims in the capital be cremated has led to people with symptoms hiding at home, because cremation violates traditions. Doctors Without Borders, known as MSF, said that as of Tuesday there were around 80 patients in its 250-bed facility. The World Health Organization said this week that the rate of infection in Liberia appears to be falling but warned that the response effort must be kept up or the trend could be reversed. The international community's response was late and figures were mostly wrong, Peter Maurer, president of the International Committee of the Red Cross, told reporters in Addis Ababa, Ethiopia. He said he is concerned about the "huge discrepancy" between announcements and the situation on the ground in the Ebola-affected countries. More than 13,500 people have been sickened by the disease, and nearly 5,000 have died, the World Health Organization said Friday. That toll has about 130 fewer cases than the one released by WHO two days ago, mostly because a number of suspected cases in Guinea were determined to not be Ebola, the agency said. 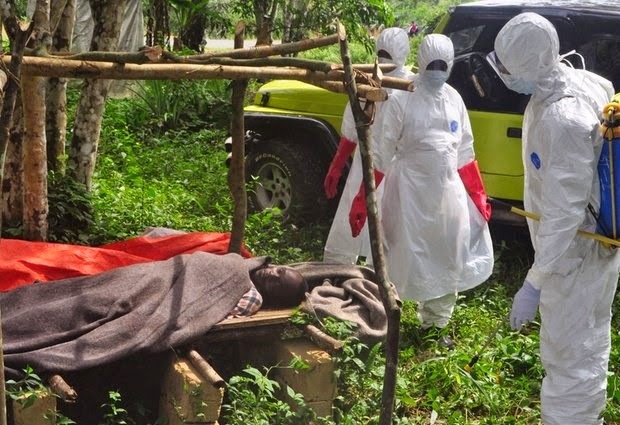 The outbreak has hit Liberia, Sierra Leone and Guinea hardest and all three countries have resorted to extraordinary measures to combat it. Sierra Leone has had a state of emergency in place for three months that bans public gatherings and, at one point, the entire country was locked down for three days to seek out hidden cases. There have been rumors that the emergency measures would be lifted, but Attorney General and Justice Minister Franklyn Bai Kargbo told AP on Friday that they are still in force. By law, they can last for 12 months and parliament put no time limit on them, he said. While the disease is beginning to let up in some of Sierra Leone's eastern districts, infections are continuing in the capital and surrounding areas. Despite some signs of hope in Liberia, many officials warn that the fight cannot be let up. Sirleaf said the memory of sick and dying people with no place to go is still too fresh. Despite those dark days, Liberia health workers fought on, she said. "To our health workers," she said, "we owe you a lot for the courage you continue to bring forth." Clarence Roy-Macaulay in Freetown, Sierra Leone and Elias Meseret in Addis Ababa, Ethiopia contributed to this report.